Another off-day for the M’s, another chance to check in with the Tacoma Rainiers down the road. If you’ve tuned in to 850am (for out of area folks, you can listen on line here), you’re aware that they’re completing the suspended game from yesterday (it just ended 2-1, OKC). You may also be aware that it’s pouring. IF the regularly scheduled game takes place, it’ll feature Luke French for Tacoma versus Doug Mathis for Oklahoma City. Rangers prospect Tanner Scheppers started the first game today, which began in the 5th. He went three innings, gave up no hits/runs and struck out 7. Last year, Neftali Feliz made a big splash with the Rangers after a mid-year promotion. Sadly for M’s fans, Scheppers could do the same this year. 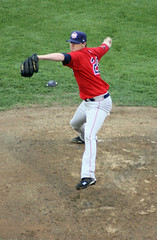 Given his health problems, he’s not a bankable #1 going forward, but the righty hit 98 today and showed a nasty slider. He’s good, and if his arm stays healthy (a huge if), he can impact the divisional race in August/September. Edited to add photos of Scheppers from tonight below…. As you might expect on an off-day like this, Jack Zduriencik is at the game, trying to stay dry. Luke French, Brad Nelson and Mike Carp are the guys that get mentioned as possible call-ups. Tommy Everidge’s chances have dwindled as Mike Sweeney warmed up, and Matt Mangini needs some help as well to get a spot on the 40-man and active rosters. Mangini and Everidge have both helped their cases though; Everidge is a hot hitter now after a blistering 2009 with Sacramento, and Mangini is hitting well after many M’s prospect watchers labeled him a bust (and I include myself in that group) following a horrendous 2008 and a better, but just OK 2009. He’ll need to show that his recent power surge is for real to have a shot, as his defense is never going to be a strong point. I haven’t said this often, but despite Scheppers weird hitchy delivery, it still looked like effortless velocity. Very strange. Rainiers lead 1-0 moving to the bottom of the 4th. Luke French has allowed 2 hits, 0 runs, 0 BB, and has 2Ks. Another typical start for him; not a ton of Ks, not a ton of GBs, not a ton of runs. Yeah, Mike, Scheppers at 95 was pretty effortless. I’d just gotten through saying to Divish that the talk of him working to 97/98 seemed to be a bit overblown, and he reached back and K’d Halman on two FBs at 97-98. He can reach back and add a bit more. And the magic’s gone for Luke French – he’s been tagged for 3 runs (so far) in the 5th. 3-2 OKC.